Edwin van Ankeren left Odd Grenland at the end of 2003. He has played for three seasons for the club after playing periods in Belgium and France. 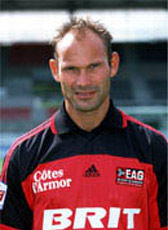 In January 2004, Van Ankeren started as player/assistant-coach at Tollnes, a club in the Norwegian second division. He decided to return home in summer 2005 to play for the new professional club, FC Omniworld. He signed a contract for one season. Edwin van Ankeren has retired from professional football in April 2006. His final match was FC Omniworld - FC Dordrecht on April 7, 2006.